Click on the image to see its parameters. This is a coloring formula that is really a fractal formula--it is not intended for use with Mandelbrots or Julias, but rather, combines the fractal calculation with the coloring into one. It is best used with a Pixel fractal formula. 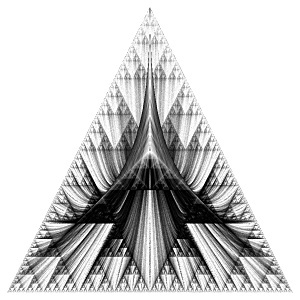 The basis for this is the Chaos Game, often used as introduction to chaos and fractals, and typically used to generate the Sierpinski triangle. Here is a video of it in action. In the standard chaos game, three anchor points are chosen on a plane. 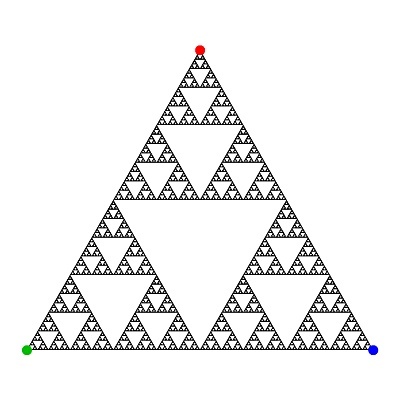 These are the corners of the Sierpinski triangle and are shown as the red, green, and blue dots in the figure below. To begin, a random point is chosen and drawn. Then, at each iteration, one of the anchor points is chosen randomly. A new point is drawn, halfway between the old point and the chosen anchor point. 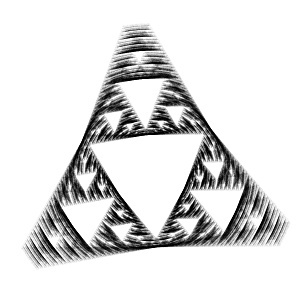 Repeat a gazillion times to get the triangle, which is the attractor for this process. That's why, no matter what point you choose initially, you'll always get this same picture. where the new point is relative to the old point and the anchor point (halfway between them). 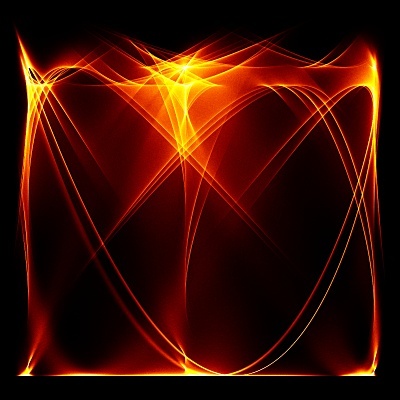 In the dynamic chaos game, the anchor points are not fixed, but can rotate around a circle, a superellipse, a rose curve, a Lissajous curve, or slide back and forth along a segment. How fast the anchor points move, the probability of a particular anchor being picked, and how far along the line between the old point and the anchor the new point is, can all be set. Below are examples showing the Sierpinksi triangle with the anchor points rotating slowly around a circle, the triangle with the anchors rotating fast, and the triangle with the anchor points sliding to and from the center. Click on an image to see its parameters. The parameters are in three groups: curve, anchor point, and general drawing. Curve Parameters. These determine the curve along which the anchor points move. For the "curve type," choose from "segment," "circle," "superellipse," "rose," and "Lissajous." segment: For the segment, the two endpoints will be set below. Here, pick the "sliding type," how the anchor point accelerates along the line between the two endpoints. The choices are: "cosine," "sine," "ramp," and "sawtooth." as the power gets large (say, more than 4), the superellipse comes closer to a rectangle. rose: Set the amplitude and frequency for both the cosine and sine factors. 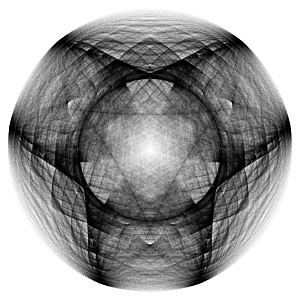 lissajous: Set the amplitude and frequency for both the x and y variables. segment: Set the two endpoints of the segment. circle, superellipse, and lissajous: Set the initialization. "Automatic" distributes the points evenly around the curve, with point 1 being at 0 degrees (right edge), and moving counterclockwise. To set the angular location yourself, choose "manual." velocity: How fast the anchor point moves, and in what direction. For all the rotation curve types (all but "segment"), positive values means counterclockwise rotation and negative means clockwise. With the "segment" type, positive means sliding initially from the first endpoint to the second and negative means initially sliding from the second endpoint to the first. distance factor: Where the new iteration point is relative to the old point and the anchor. Halfway between is 0.5. Zero is right at the anchor and 1 is right at the old point. probability weight: How often, relatively, that this anchor is chosen. If all the weights are the same, then each anchor will be equally likely to be chosen. To make point 2 (say) twice as likely to be chosen as point 1, make point 2's weight twice that of point 1.
sampling factor: Set higher for more iterations (longer rendering time) or lower for fewer (shorter rendering time). transients: How many times to iterate before drawing a point. Use this to not draw the first few points, in case your initial z value (below) is way outside of the attractor. scaling: The image is colored by how often the iteration point lands on each pixel. This parameter determines the relationship between hits and color index. linear: Each additional hit adds the same amount to the color index. If there are a lot of hits (say, a large sampling factor), then this mode can be quite noisy. logarithmic: The relationship between hits and index slows as the number of hits grows. Great for reducing visual noise. hyperbolic tangent: Similar to logarithmic, but the color index will not wrap around. Beyond some limit, all hits will be mapped to the same color index. pre-density: Like the "Color Density" setting, but applied before the scaling function is used. Only available with the "linear," "logarithmic," and "hyperbolic tangent" settings. average: The average of the anchor point numbers used resulting in hits on that pixel. For example, if a pixel was hit three times, from anchor points 1, 2, and 6, then the average would be 3.
which: The number of times the pixel was hit when the iteration used the anchor point indicated by "which point." For example, if "which point" were 4, then this mode would color by how many hits the pixel had when anchor point 4 was chosen. last: The index of the anchor used when this pixel was last hit. solid background: Check to use the "Solid Color" for the background. Otherwise, color index 0 is used. initial seed: Initial seed value for the random number generator. Generally, the value doesn't matter, but it will give slightly different results when changed. initial z: Initial z value. Generally, the value doesn't matter, but it will give slightly different results when changed. This is one of those coloring formulas that does all the work. It is intended to be used with a "Pixel" formula, like the one in lkm.ufm. Start with a relatively low sampling factor, say around 10, when designing your image. Then, increase it to fill in the details. To use the "hyperbolic tangent" setting to best effect, clear the "Repeat Gradient" box and have a gradient that has different beginning and ending colors, say black at index 0 to white at 399. To reduce the grainy effect, average together several layers with only the initial seed and/or the initial z changed. Here’s how to make the image at the top of this page. Formula: "Pixel" from lkm.ufm, with the default settings. Outside: "Dynamic Chaos Game" from lkm3.ucl, with the default settings. Clear the “Repeat Gradient” box. Image: set the width to 600 pixels and the height to 600 pixels. Location: Set the Center to -0.12/-0.02, the Magnification to 2, and the Rotation Angle to -90. Your image should look like a white off-center disk with a black hole in the middle and black and yellow bits at the edge. For point 1, leave the "initialization" at "automatic" and the "velocity" at 1. Set the "distance factor" to 0.9 and leave the "probability weight" at 1. For point 2, leave the "initialization" at "automatic" and set the "velocity" to -2. Set the "distance factor" to 0.9 and leave the "probability weight" at 1. Having relatively large distance factors makes the image more cloudy. Set the "sampling factor" to 50 and the "scaling" to "hyperbolic tangent." Set the "pre-density" to 0.1 and check the "solid background" box. This layer should resemble the example image, but grainier. To fix that, let's average together some more layers. Duplicate this layer three times. Each layer should have the "Normal" merge mode. Change the "initial seed" and "initial z" on each layer so that they're all different. If you wish to add more layers, set their opacities to 100% ÷ the layer number (so Layer 5 would have an opacity of 20%). Your image should look like the example. If not, go snag the parameters from the examples page.